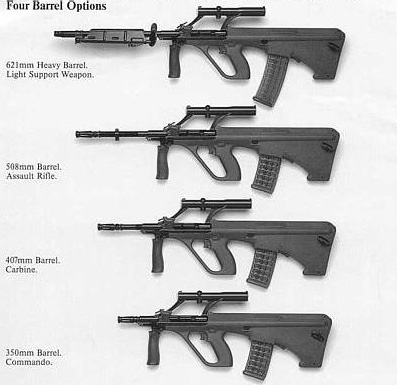 The 16 inch aug is a very useful variant of the AUG. It is a middle weight allowing for accuracy out to 300 M but a shorter weight for manipulation in tight quarters. The most specific aspect of this rifle for the American user is its collection value. Valued between 4000-7000 for an Black A2. 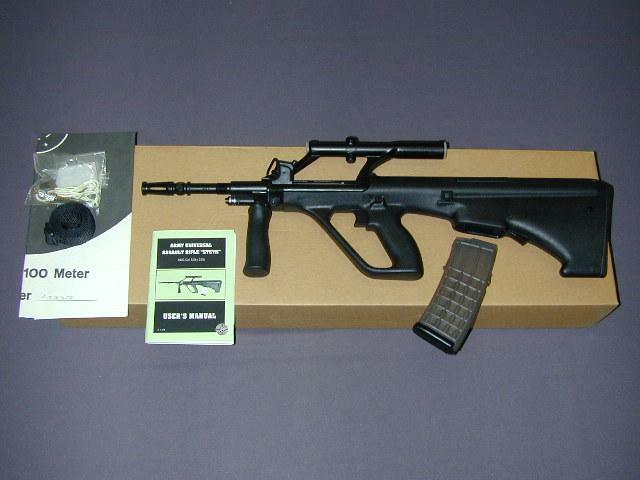 Many 20 inch green variants have been died black and the barrel cut to mimic a black aug.
"Check the barrel closely on a black AUG to see it was a green AUG with a converted barrel. I Have customers that are buying the black AUG stock kits and then sending the 20" barrels off and cutting them down to 16" and selling the AUG as a black AUG matching #'s gun for a premium price. The green AUG barrel is threaded on the outside of the barrel from the flash-hider down to the stock. The factory black AUG's have only 1" of threads showing. They start at the gas piston and are only 1" in length."